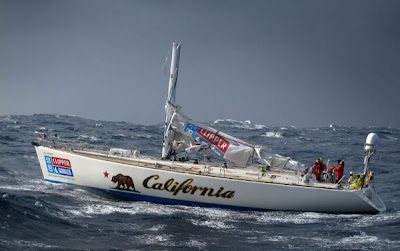 The Yacht "California" skippered by Londoner Pete Rollason limps across the Pacific Ocean after being dismasted by during violent storm, whist racing from Qingdao to San Francisco. The yacht was hit side on by a vast wave causing it to roll, breaking the mast in the process. 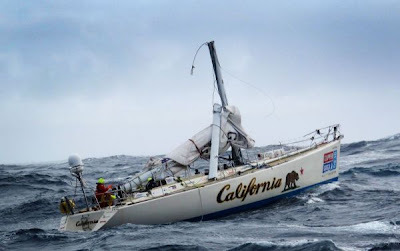 Following the incident which took place on Sunday afternoon GMT in which the California entry in the Clipper 09-10 Round the World Yacht Race was rolled in a fierce Pacific storm, the Danish registered tanker, Nord Nightingale, is now at the scene. The 180-metre tanker was on passage from Yokohama to Los Angeles and diverted by US Coastguard last night. It's a standard rule of the sea that vessels divert when another is in distress and the intention was to transfer injured crew member Clive Cockram on board. Clive was sitting in the saloon when the boat rolled and was thrown across the cabin, ending up with cuts to his head. He responded well to treatment but it is prudent to ensure that he swiftly gets the best medical care. While the winds have dropped from the 60 knots experienced over the last few days, the sea state is still confused and to make the transfer required excellent seamanship from both the crew of California and the Nord Nightingale. After several attempts, Clive was safely transferred and the launch was recovered to the merchant vessel. Once on board, the first thing he asked for was to make a phone call to his Mum! The 53-year-old company director informed her that he requires some stitches to his wounds but that he was feeling OK and was being very well looked after. He promised to call her again when the vessel docks in LA on 31 March. Fellow crew member, Dennis Flynn, was also taken on board. 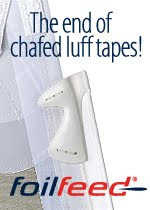 Dennis had signed up to sail Leg five of the Clipper Race and since the start in Qingdao, he has experienced more than most sailors will ever go through. As an American citizen, the captain of the Nord Nightingale considered it helpful to have him on board to assist with immigration and medical issues as the vessel nears Los Angeles.